This book title form Cuban writer Reynaldo Arenas is from one book that has perturbed me since I read it first. The autobiography of sorts of a gay Cuban writer who welcomed naively the arrival of Castro and the sexual liberation of those earlier days, until the regime became the repressive puritanical bastion still expiring today. If it is definitely one of the best books on the Cuban revolutionary reality, it is also one of the best books, for its flaws since it was written in a rush before arenas died, on how a regime, any regime, becomes an oppression. Tonight I will wait patiently until midnight, to watch the RCTV signal go out. Not because I particularly liked RCTV: I am a cable person, Animal Planet, History channel and the mindless entertainment of Sony or Warner Channels are my cup of tea. No, I will wait because tonight, at midnight we, Venezuelans, as a a people will lose freedom of information, and most of our freedom of expression. It is historical and the historian in me cannot help but live it. I do not care about what comes next on the #2 Hertzian wavelengths: as soon as darkness falls on RCTV I will turn off the TV and go to bed. TeVes will be a fiasco because the government will never grant it the freedom of becoming a Latin American BBC. It id not do it with VTV, it did not do it with ViVe, it did not do it with ANTV, it did not do it with TeleSur. It certainly will not do it with the new monstrosity coming to pollute our broadcast ranges. If there is anything that chavismo has amply demonstrated is that it does not have the personnel to make great TV. It will never have it because the chavismo system cannot sponsor creativity, which is based on criticism. Great art is always based on criticism, on art criticism, and political criticism. Besides, if truth be told, Chavez does not care whether TeVes is good or not, he only cares about shutting up the dissent of RCTV. But I am not pessimistic tonight. Chavez will pay a heavy price for this closing. Even the shootings of CONATEL this afternoon can be blamed on him even if the bullets come from the opposition side. Who shot within the opposition? 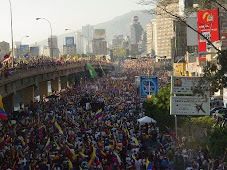 Could it even be a chavista obeying orders and hiding in the crowd? And if it were an opposition radical, why has s/he been radicalized to that extreme? Can the government plead innocence after the extraordinary verbal aggression it has subjected the country for weeks of cadena after cadena to insult whomever does not agree with Chavez? Violence is inevitable and it comes as much from the insulted and dispossessed oppo guy as from the chavista guy whipped irresponsibly into frenzy by Chavez and his lackeys. What can you expect when the vice president says that whomever defends RCTV is a mercenary? Is it not a license for chavista to shoot such people? Is it not a license for those aggressed to shoot before they are shot at? The ones that must go on trial here no matter who gets a bullet are Rodriguez, Chavez, Lara and their helpers. But more importantly, and a consolation of sorts for me, is the intensity of the international response to the closing of RCTV. Anyone who is anybody in the world has either condemned Chavez or at least remained silent, and definitely refused to support Chavez. Only a few, a surprisingly very few, have come out to support Chavez and they have no credit anyway. You can see it everywhere, from the desperate and ridiculous accusations of Minister Lara today to comment sections at Publius Pundit from pro Chavez Anglos losing their grip on things. Indeed, one from that side should be pissed off: 6 months of intense propaganda and you get editorials such as the one from Le Monde. Millions of dollars in paid services gone to waste, thousands of hours of "grass root" working for naught. The world is unto Chavez, and them, and they know it. Yes, it is a small consolation but it is an important one. Chavez has lost any respectability he might still have had, and there is nothing he can do to recover it. When, say, Mugabe or Fujimori did this sort of things, they stopped been received where it mattered. Their regime started to unravel as they started losing the respect of their people even if those for a variety of reasons kept voting for them at first. And we know all that Chavez pins for international stages. Many will be denied him now. A new fight starts tomorrow and I am full of energy for it because now the people who matter in the world, those who think, those who create, those who feel, are on my side. To those readers that are still bearing up with me tonight, who are probably quite depressed, do not be depressed. Our fight is going to become easier intellectually and emotionally though not materially: we will finally start being heard all around, Chavez mask is begin lifted. Oh, he is far from gone, but for the first time his image is seriously dented and there is no telling how such chipping evolves. So maybe we are at the hour where darkness falls on us, but light can only come after darkness. Reynaldo Arena escaped Cuba. Cuba will escape Castro and Venezuela will escape Chavez. Someday, you can count on it. And we might have reached that road tonight!